Fig. 1. Stylodictya placentalis sp. nov., p. 32. Holotype, x130, sample No 16/1:1. Santonian. Fig. 2. Tripodictya triacuminata sp. nov., p. 33. Holotype, x130, sample No 16/9. Santonian. Fig. 3. Euchitonia santonica sp. nov., p. 34. Holotype, x130, sample No 16/42. Santonian. Fig. 4. Hagiastrum crux sp. nov., p. 34. Holotype, x130, sample No 8/19. Campanian. Fig. 5. Histiastrum cruciferum sp. nov., p. 34. Holotype, x130, sample No 8/19. Fig. 6. Histiastrum aster sp. nov., p. 33. Holotype, x130, sample No 16/28. Santonian. Fig. 7. Histiastrum aster sp. nov., p. 35. x130, sample No 16/27. Santonian. Fig. 8. Histiastrum membraniferum sp. nov., p. 35. Holotype, x130, sample No16/26. Santonian. Fig. 9. Histiastrum irregulare sp. nov., p. 35. Holotype, x130, sample No 16/29. Santonian. Fig. 10. Tesserastrum quadratum sp. nov., p. 38. Holotype, x130, sample No 16/39. Santonian. Fig. 11. Rhopalastrum trigonale sp. nov., p. 36. Holotype, x130, sample No 16/3. Santonian. Fig. 12. 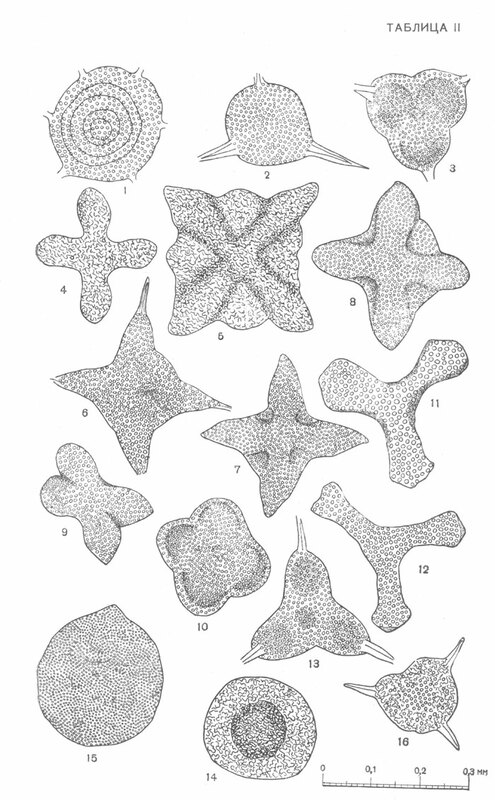 Rhopalastrum trigonale sp. nov., p. 36. x130, sample 16/1. Santonian. Fig. 13. Rhopalastrum tumidum sp. nov., p. 37. Holotype, x130, sample No 16/43. Santonian. Fig. 14. Spongodiscus impressus sp. nov., p. 38. Holotype, x130, sample No 8/14. Campanian. Fig. 15. Spongodiscus citrus sp. nov., p. 39. Holotype, x130, sample No 15/2. Santonian. Fig. 16. Spongotripus aculeatus sp. nov., p. 39. Holotype, x130, sample No 28/1. Turonian.